4D/3N MINANGKABAU EXOTIC GETAWAY DAY 1: PADANG –ANAI VALLEY WATERFALL – MICC – PANDAI SIKEK - BUKITTINGGI Upon arrival at Minangkabau International Airport (BIM), you will be greeted by our tour guide and whisked away to Bukittinggi, West Sumatra. En route, we will stop by to enjoy the gorgeous Anai Valley Waterfall surrounded by rich tropical forest. The journey continues to Minangkabau Information Centre of Culture, the perfect place to learn the A-Z of Minangkabau’s exotic tradition, culture and history. Next, we’ll head over for a shopping spree at Pandai Sikek Village, where you can get the diverse & distinguished weaving and wood carving specialty from West Sumatra. Overnight at Bukittinggi hotel. DAY 2: BUKITTINGGI - HARAU - LAKE SINGKARAK - BUKITTINGGI After breakfast, we’ll take you to explore the unforgettable beauty of West Sumatra. Starting from Harau Valley – the charming splendor of Indonesia’s “Yosemite”, where you will be treated with a stunning panoramic view of lush green rice paddies flanked between the towering granite cliffs. You will find plenty of mini waterfalls running down the valley from different height. Definitely not a sight to be missed! Continuing to the next destination, we will pass by a scenic landscape of Tabek Patah at the slope of Merapi mountain and stop at Kiniko Home Industry for culinary shopping. Observe the Minangkabau heritage at Pagaruyung Palace and Balimbing Village before arriving to the majestic Lake Singkarak. Enjoy the quiet natural beauty of the biggest lake in West Sumatra. Overnight at Bukittinggi. DAY 3: NGARAI SIANOK – BUKITTINGGI CITY TOUR - LAKE MANINJAU - PADANG More mesmerizing destinations and cultural portal awaits today’s adventure! We’ll start with a visit to the breathtaking Sianok Grand Canyon (Ngarai Sianok), where your eyes will feast on the lush canyon, the green valley paired with the majestic stone cliffs. Make sure you have your camera ready to capture this arguably best scenery in Bukittinggi. Next, we will stop by the iconic “Clock Tower” that serves as the landmark of Bukittinggi, followed by a visit to Koto Gadang to view their renowned silver work and not forgetting the souvenir and handicraft shopping time at Traditional Market “Pasar Atas”. Last but not least, unwind and soak in the tranquil atmosphere and peaceful view of Lake Maninjau before we head back for an overnight at Padang. Day 4: TRANSFER OUT TO AIRPORT After breakfast, feel free to do your own activities until our guide picks you up for airport transfer. We trust you had a pleasant trip and sincerely hope to see you again on your next trip! 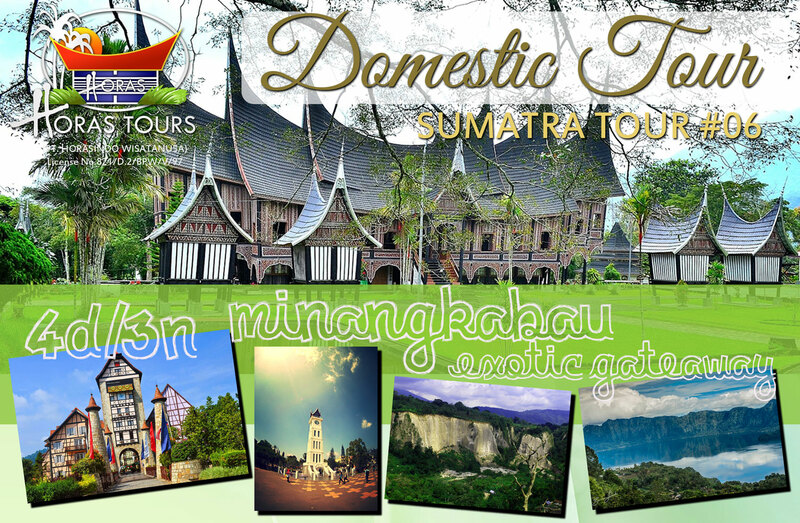 Please enquire with us with your travel needs to get comprehensive price for Sumatra 6 tour package. Feel free to contact us for special tour arrangement.